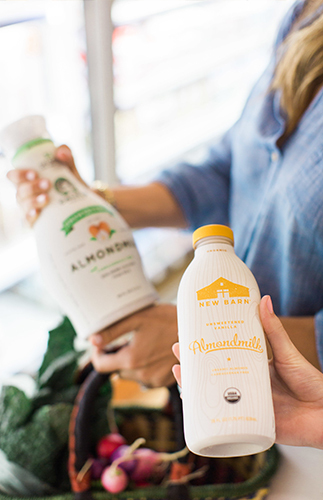 Be it Trader Joe’s, Whole Foods, or Costco (coming soon! 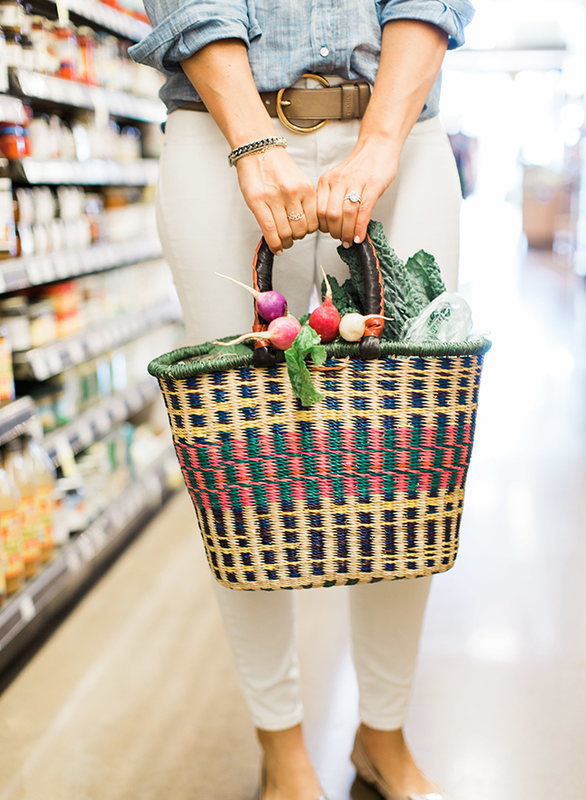 ), everyone has their go-to grocery store and everyone has their go-to items they purchase there. 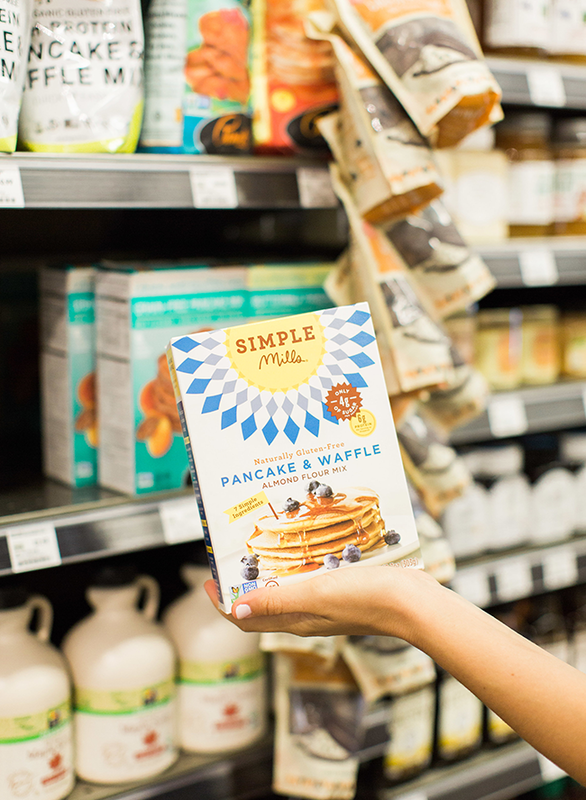 Whether it’s that jar of peanut butter or carton of eggs, there are a few things we never leave the store without. Well, to re-orient what we’re purchasing we recruited Lindsay, of Weeknight Bite. 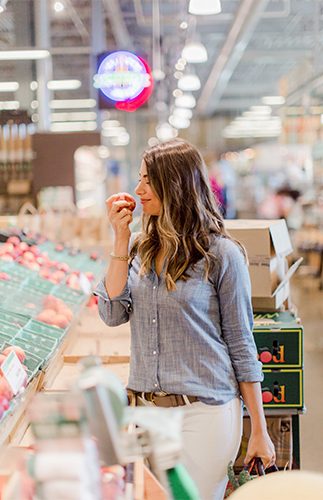 She’s helping us ensure we pick out the best options at the grocery store – and keep re-picking them. 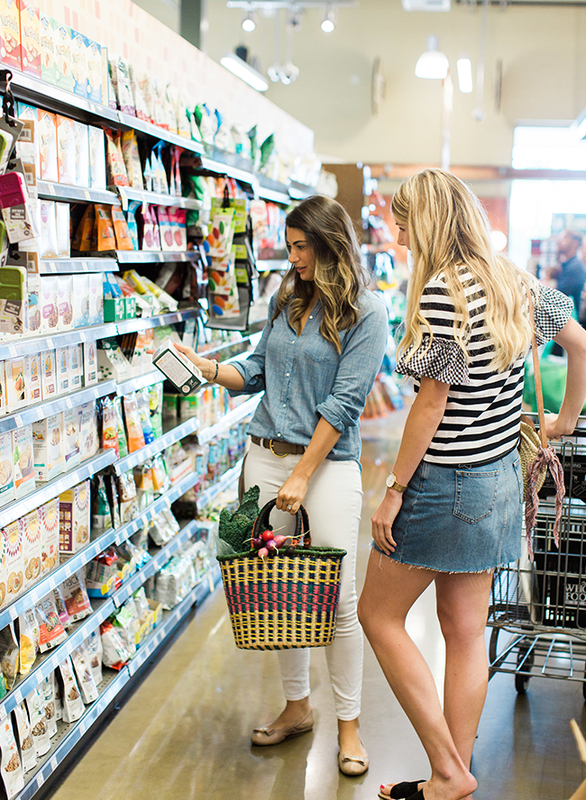 With a nutritionist’s grocery list to Whole Foods you have that little angel on your shoulder helping you put the right things in your cart. 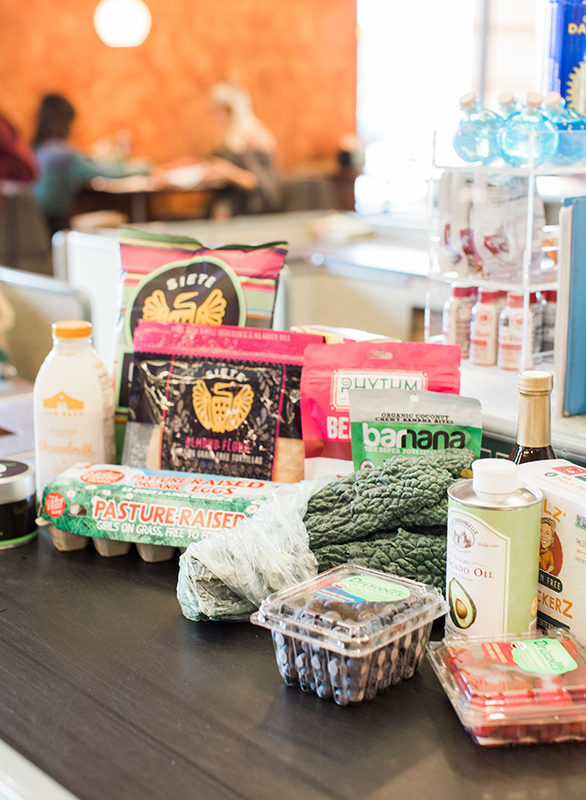 Yes, even Whole Foods has items you should avoid (seriously!). 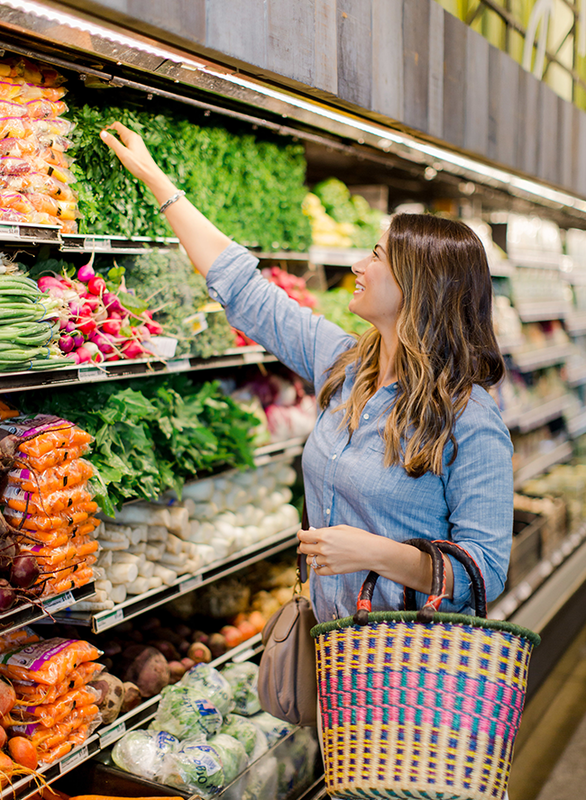 Here, we walk you through the entire store, section by section, and show you the produce, packages, and more you should be on the hunt for. 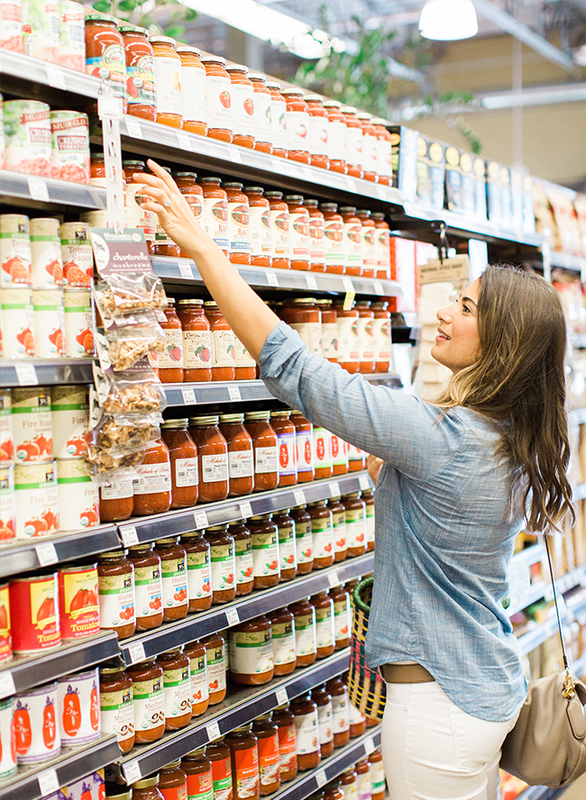 Ingrain these images in your mind and pin the grocery list for easy reference! 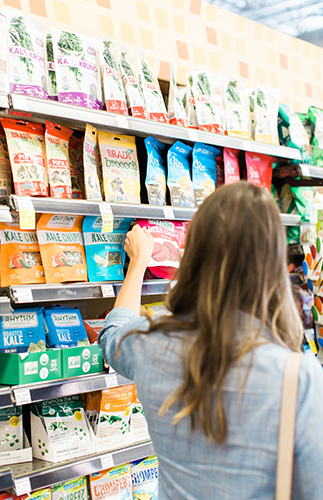 Once you have the hang of reading ingredient labels and choosing healthy essentials, you will feel better about what foods you are eating and what you are spending them. Microgreens – These are perfect for adding into smoothies (just a pinch!). My go-to is broccoli sprouts, which are high in sulforaphane, an anti-inflammatory, anti-cancer molecule. 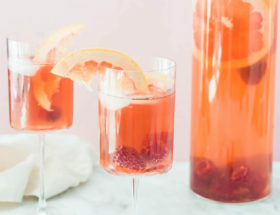 Herbs – I always have fresh mint on hand for making spa water, fresh mint tea, or for adding into my mint chip smoothie! Pre-chopped fruits & veggies: Whole Foods sells fresh zucchini noodles, carrot noodles, beet noodles, and sweet potato noodles that have already been spiralized! Pre-chopped veggies like jicama are also great for grab & go snacking, and chopped mirepoix (carrots/onions/celery) is a quick and easy starter for soups. 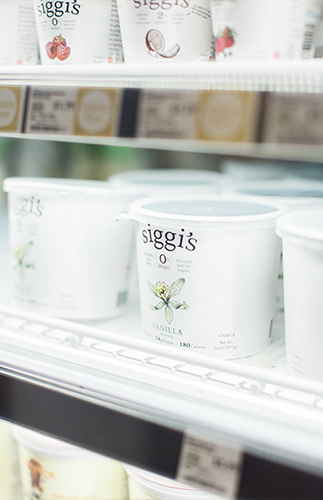 Organic yogurt – Siggi’s is a great brand, as is Green Valley Organics (which is my go-to since it’s lactose-free!). Tip: buy plain yogurt to avoid all the added sugar and add your own fruit or granola to it! Kite Hill Cheeses (Original, Truffle Dill & Chive, Ricotta) – They are dairy-free and made from almond milk! 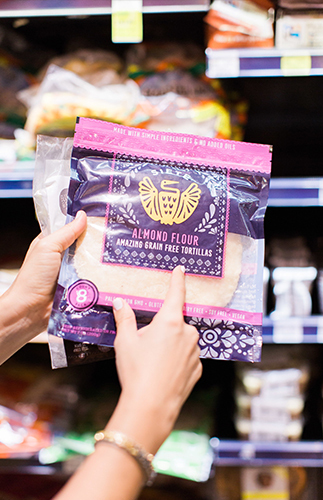 Siete Foods tortillas – These are definitely one of my top 5 Whole Foods products and a perfect swap for regular tortillas. I go for the Cassava & Chia flavor or Almond Flour. Fresh Whole Foods guacamole – always check ingredient labels for unnecessary additives! Chia Pods – go for the Vanilla Bean which doesn’t contain any added sugar or the Dark Cacao flavor which is sweetened with coconut sugar. Sambazon or Acai Roots Organic Pure Unsweetened Acai packets – These are great for smoothies! Plus, there’s 0g sugar! 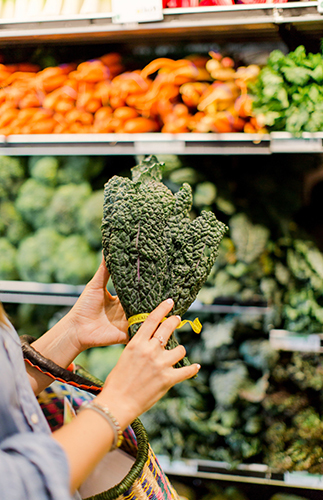 Organic Veggies: organic spinach, kale, broccoli (florets or broccoli rabe), cauliflower, etc. Organic brown rice – so quick, just needs to be heated up! Organic white quinoa – just needs to be heated! Caulipower Pizza – 3 options of cauliflower crust pizza: three cheese, Mediterranean, or Just the Crust. 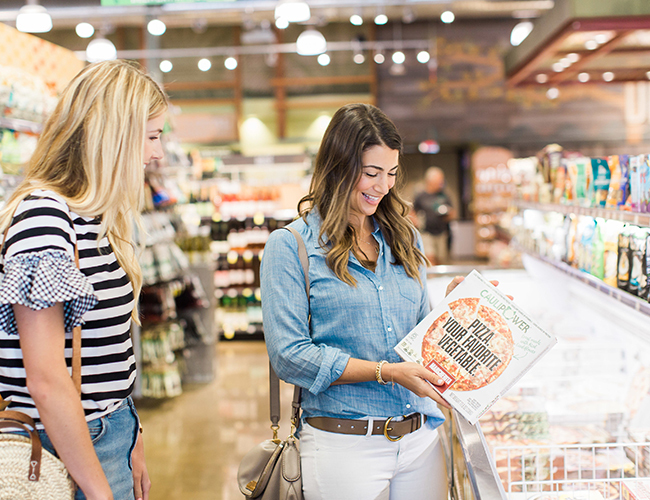 Buy the crust and all of your favorite toppings for a fun DIY pizza night at home! 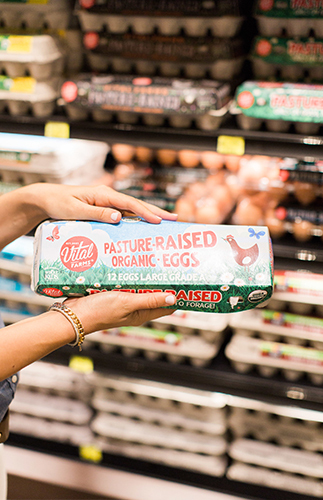 Organic plain yogurt – See recommendations under refrigerated packaged goods! 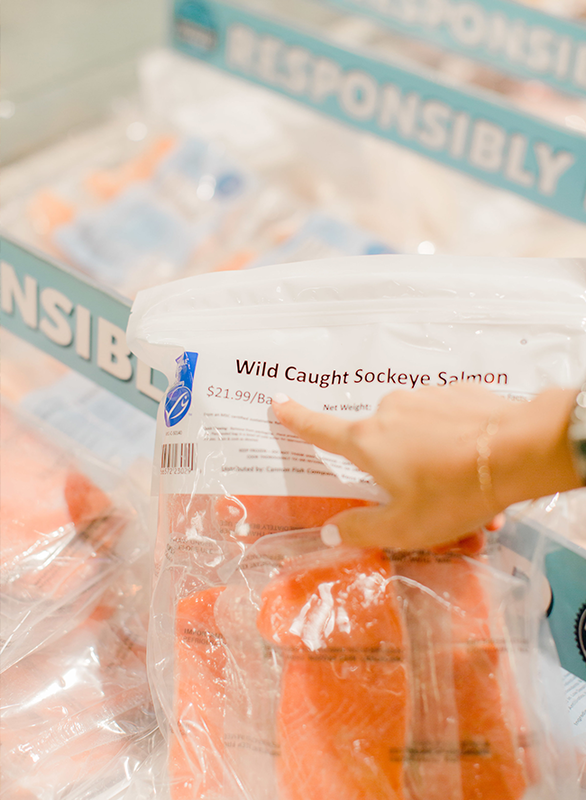 Wild fish & shrimp from the seafood section – I always like to ask the fishmonger which wild fish is freshest that day and see what they recommend… it’s a good opportunity to try something new! Sushi! One of my favorite on-the-go lunches is their garden sushi roll with salmon or tuna – they’re rice-free and wrapped with tons of veggies. I also love to buy their sashimi and make my own poke bowls at home. 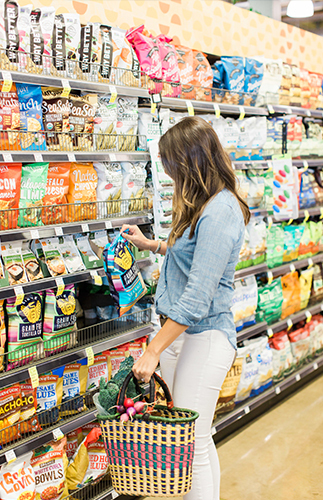 Prepared foods counter: This is a great spot for grab-and-go items! 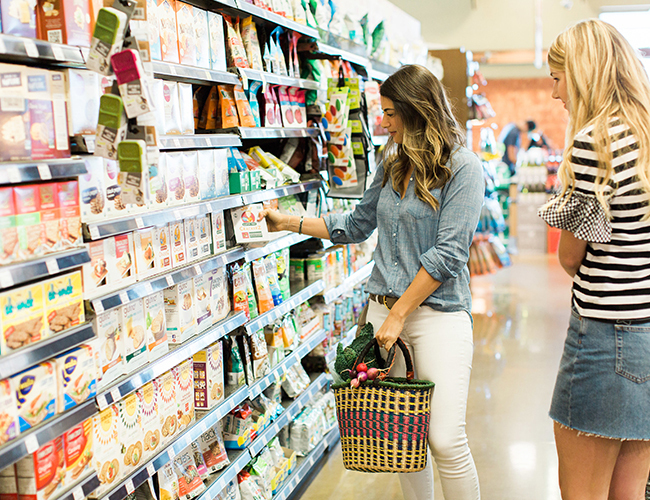 There are tons of delicious options – just make sure to double check the ingredients in the foods you’re choosing (you’d be surprised how often you find canola oil in their prepared products). 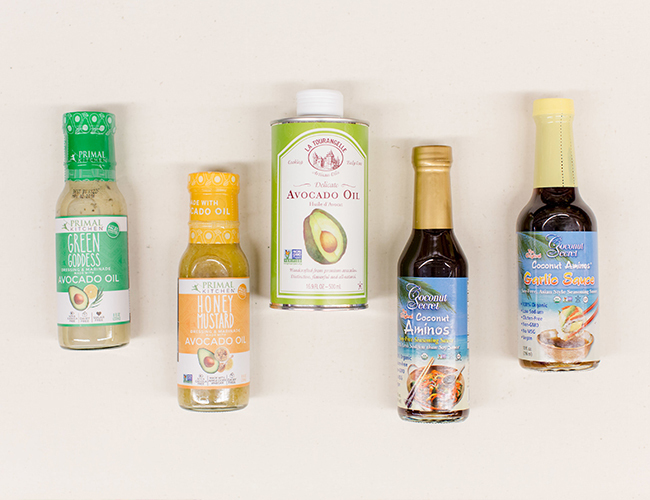 Avocado oil – a must for high-heat cooking – it has a much higher smoke point than olive oil! 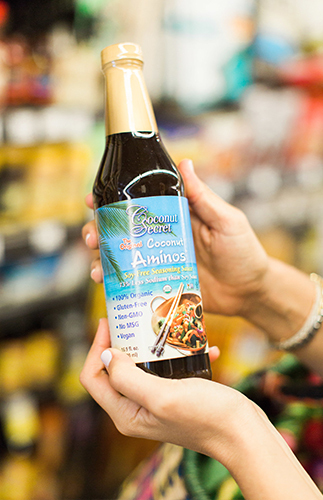 Coconut Secret Coconut Amino’s – This is an amazing swap for soy sauce! It is lower in sodium and made with coconut instead of soy. Alvarado Street Bakery sprouted breads, burger buns, and bagels – These have pure ingredients and are higher in protein than most breads. Simple Mills crackers – another one of my top 5! 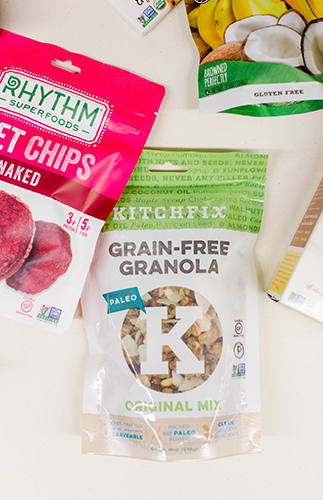 All of the flavors are delicious and they’re made from nuts and seeds (totally grain & gluten-free). 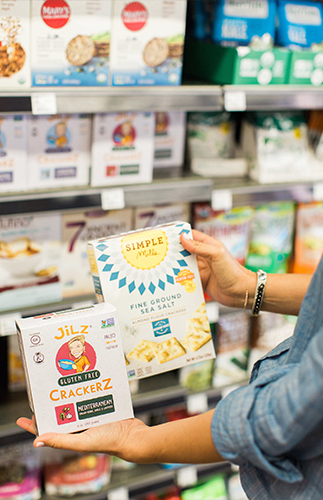 Jilz Crackers –grain-free, gluten free crackers… a totally Paleo snacking staple! 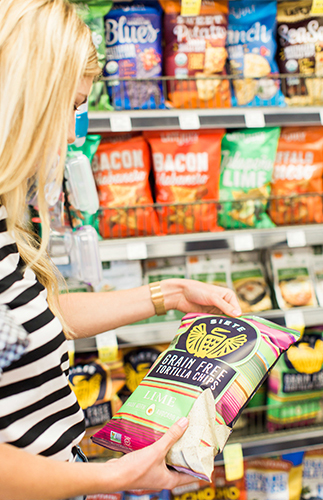 Siete Foods tortilla chips – a must try! 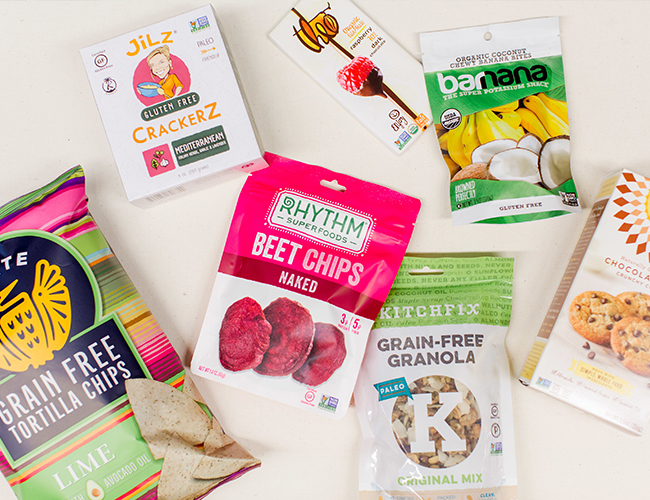 Tons of yummy flavor options. 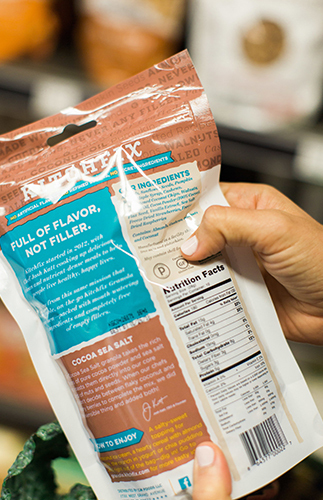 Nuts – You can buy these by the bag or in the bulk section. Some stores even sell sprouted nuts in bulk. Nut butter: 365, Nuttzo, Artisana, and Once Again are great brands. Always check the ingredient label to make sure there’s no added sugars in your nut butters! Some of these brands also come in on-the-go packs which are great for travel or taking to work. Grind-your-own nut butter: most Whole Foods have an area near the bulk section where you can grind fresh nut butter. Gotta love that it’s made from just one ingredient! 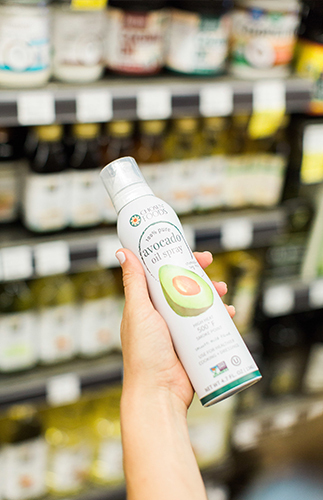 Organic Sunbutter – perfect if you have a nut allergy or just want to change things up. This is made with one ingredient, sunflower seeds! 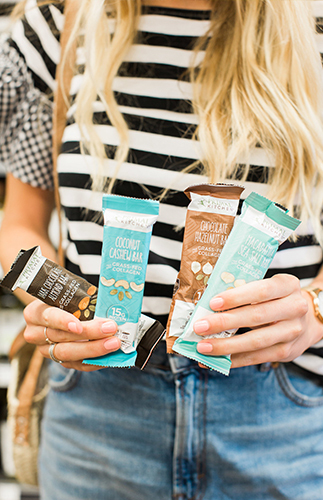 Eating Evolved coconut butter cups – I love the mint cream & caramel sea salt. They are the perfect way to cure the sweet tooth. 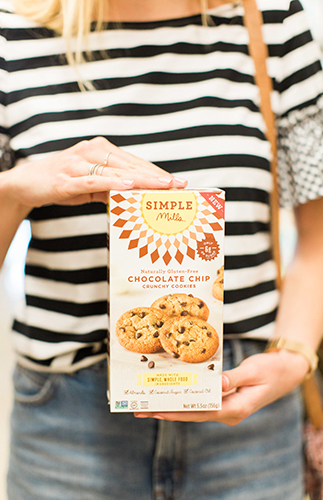 Simple Mills naturally gluten-free crunchy cookies – the chocolate chip cookies taste like Famous Amos! Matcha powder – I recommend the ceremonial grade Do Matcha for at-home lattes! Bragg nutritional yeast – a great cheese substitute that’s full of B-vitamins! Organic liquid stevia drops – keep this in your purse and use it instead of artificial sweeteners. Coconut water – look out for sugar content! I like Harmless Harvest. Ok, we know this is a lot to remember! So, make sure you save these lists on your Pinterest. 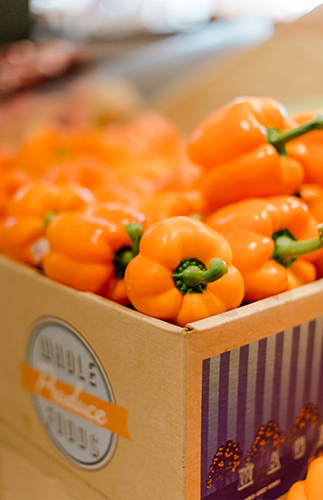 Some of these items you will only have to purchase every few months and some will be on your grocery list weekly. 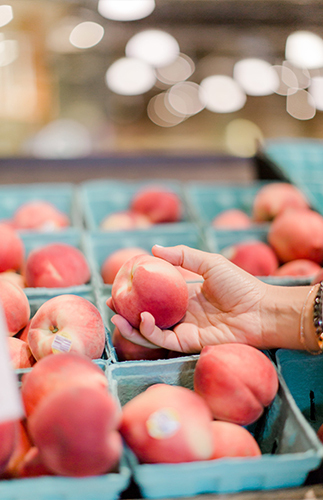 Split your time between Whole Foods and Trader Joe’s? 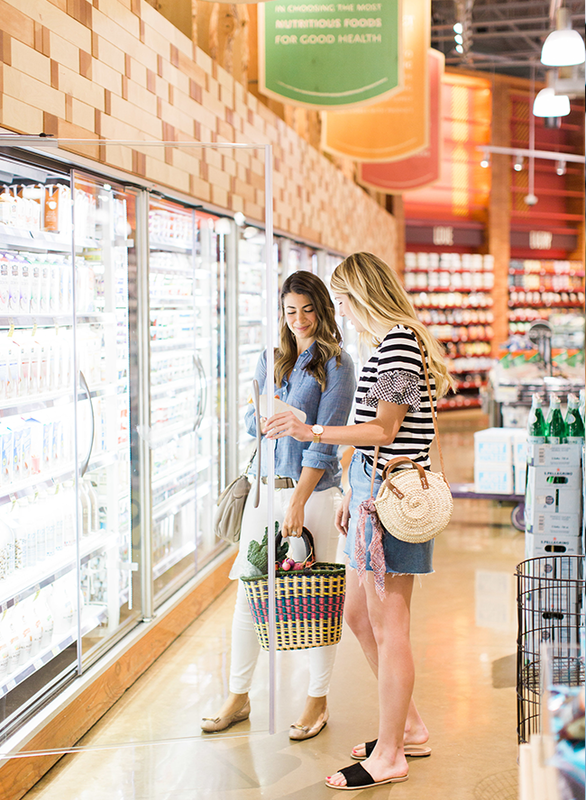 Make sure you also save Lindsay’s grocery list to Trader Joe’s! Oooh I can’t wait to take this list to the store with me this weekend! Great picks! Saving to Pinterest now!